Passengers forced to walk on the MRT rail tracks. 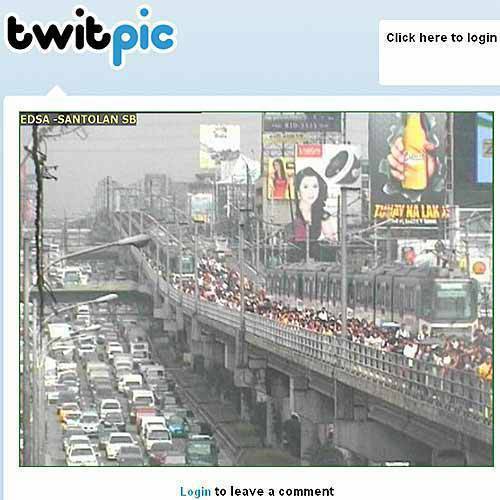 Screencap from the MMDA Twitpic account. A southbound MRT train approaching the Santolan station was stalled at around 10 a.m. today after a brake pad emitted smoke, according to the MMDA Twitter account. 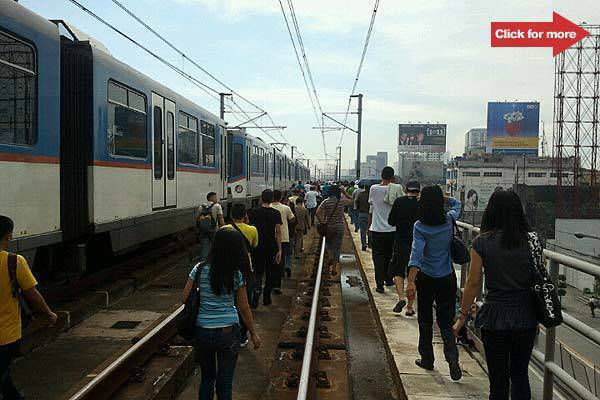 MRT Duty Manager Nestor delos Santos said there was a brake failure, ANC’s Ron Cruz Tweeted. Hundreds of passengers were forced to walk on the rail tracks, according to GMANews.tv and PhilStar.com. A passenger told PhilStar.com that another commuter supposedly panicked and pressed the coach’s emergency button. Citing radio dzBB, GMANews.tv reported that at least eight female passengers sustained minor injuries after the commotion in the train. MRT operations went back to normal at 10:34 a.m., according to the MMDA Twitter account. Summit Digital’s Dennison Ko took photos of MRT passengers forced to walk on the rail tracks. Click for more.